Bezier curves are widely used in Flash for many effects, from tweening one property to drawing complex curves and surfaces, but we have never found one Class that would allow us to work with them the way we wanted to. Our main goal writing one Class for Bezier manipulation is to have one tool that calculate Bezier interpolations for curves and surfaces of any degree, so the first thing to do was to study the mathematical model of the Bezier curves in these useful article. In the article the Bezier curves are treated as a combination of the Berstain polinomials which uses the factorial function that requires many calculations for high degrees. The previous problem is solved calculating the coefficients of the curve for the given control points and saving them on a buffer Array that helps us to speed up the calculation process for further interpolations. As the article suggests the interpolation of any curve is given in the [0 – 1] domain. * Bezier de trayectoria o superficie. //Variable que contiene las constantes de la curva bezier para un grado y una parametrización (cantidad de puntos) fija. //Función que genera una interpolación tranfinita TFI para un grupo de cuatro curvas de borde bezier. As you can see all the comments are written in Spanish and many functions have so many parameters that is somehow difficult to understand what these functions do, so i´ll try to explain every function and it´s implementation in this post and in the near future post. Anyway i´ll comment some important features of it. The combinatoriaData Array is a set of coefficients of the Berstain polinomials that are pre-calculated for degrees lower than 12, this helps us to speed the initial calculation for one interpolation. If you are going to work with a higher degree, the program calculates the coefficients for that degree and saves the values on the array. The bezier function is the simplest function of the class, it allows to interpolate one single 3D point from a set of controlPoints and a parameter value between 0 an 1. You can use this function to get the interpolation point to point. The bezierPoints function does the same thing but gives all the points of the interpolation in one array, you have to note that the “m” value is the number of points that you want to interpolate. Since all the points are equidistant in the domain space you can´t control interpolation by distance from point to point in the parameter space, but there´s one parameter that allows you to at least control the initial distance between borders and the next / previous parameter point, if you would like one margin if you are treating with surfaces (i´ll promise i´ll make one example of this, because it´s difficult to understand just by reading it). The surface function does the same thins that Away3D´s bezier surface function except that you can define the MxN control points as you want (not just 4X4 surface). To use the function you have to pass the M dimension, the Vector with the MxN points and the segmentation for the U,V direction of the surface. The last parameter, the “force” is the repetition of the control points in the surface to simulate weights for a given controlPoints, this makes the surface approximate more to the controlPoints resulting more like a Nurbs curve with the same controlPoints. The previos function is used to calculate the surface in this post . The getPatch function also returns a surface, but this surface has the property of being controlled only by the curves that defines the borders of the surface, it means that the internal values of the surface are only border dependant and there are no internal controlPoints for this surface. This function is more complicated to use, but is more versatil in some applications like transitions and deformations. Finally we have written one simple implementation of this class using only the fist function “Bezier.bezier()”. If you want to see it, just click on the image in above and relax!. We have made it thinking about one example of how beziers could be used. 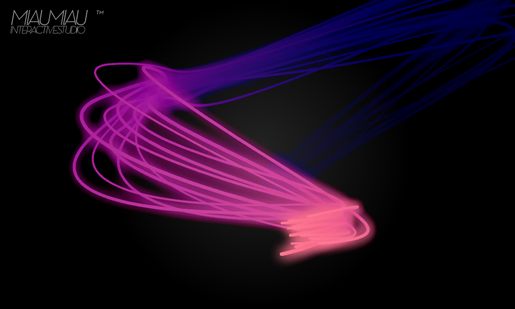 There are many implementations of beziers curves that gives the “same” look and feeling in music visualizers like Windows Media Player so perhaps the inspiration came from it.